Aumed Image 4.3 Inch HD Color Portable Video Magnifier - 4 Hours of Battery Use! Read, view photographs and write more easily, whether you're at home or on the go! 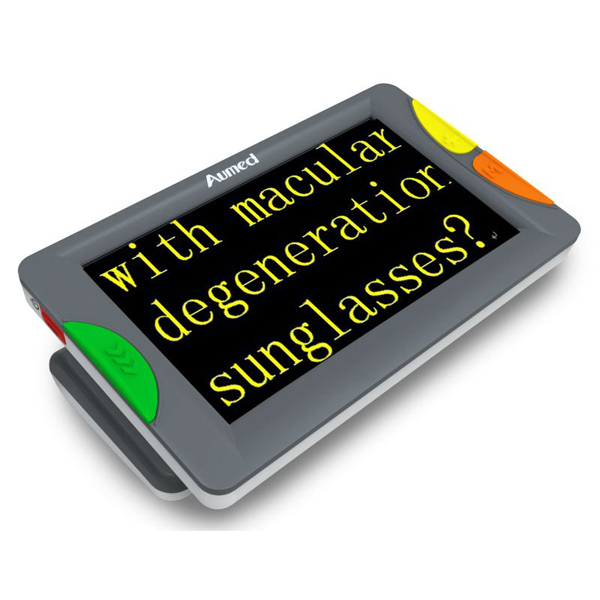 The Image Handheld Video Magnifier allows you to magnify virtually any text or image from 1.5 to 22 times on its 4.3-inch color LCD. It's small and lightweight enough to easily fit into your pocket, so you can take it with you to see price tags and food labels in stores and read restaurant menus. 4. Plug it into your TV and enjoy viewing an even larger image on the TV screen. You can select from five viewing modes and freeze an image on-screen for closer viewing. Plus, the user-friendly Image has uniquely shaped and colored buttons with tactile markings that are easy to see, feel and operate. * Freeze Frame: Take a picture and 'freeze' it on screen for closer viewing.